We’re seeking Vodafone Licensees to join us on the next phase of our journey. You’ll have an exclusive relationship with one of the world’s leading telco brands & enjoy the benefits that come with it. See below list of opportunities for licensed store locations that we will be opening. If you have a location that you've identified as an opportunity to open a store, you may be able to do this as a Select dealer, subject to Vodafone’s approval. In addition to the benefits of an exclusive relationship with one of the world’s leading telecommunications brands, our Vodafone Licensees enjoy the benefits from the on-going support of a dedicated Vodafone team focused on helping you make your business a success. 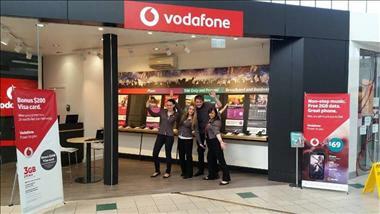 Vodafone will find the location, negotiate the lease and invest in the store fit –out. The Licensees we are looking for must have the experience and understanding on what it takes to run a profitable business. You must be passionate about delivering outstanding customer experiences, and know how to maximise and over-achieve sales across all KPIs. Vodafone’s Exclusive Dealer Agreements is a 5-year agreement, with renewal subject to Vodafone’s approval. It is not a franchise agreement, therefore you will not incur the cost of franchise fees or ongoing royalty payments. More than five million people across Australia share, play and do more on the Vodafone network. We’re about to get bigger and even better. As a Vodafone Licensee, not only will you have an exclusive relationship with one of the world’s most recognisable brands, you’ll also have a Vodafone support team dedicated to helping you make your business a success. You’ll operate your Vodafone Licence store with a focus on both consumers and small businesses (SOHO), and with access to Vodafone’s core products and services. In addition to a dedicated support team, you and your team will also have on-going access to our comprehensive training programs via face to face and online training. Remuneration includes generous commission payments with upfront and trailing commissions, and an exciting bonus payment program. There are also other revenue opportunities with sales of accessories and Prepay products. What is the most rewarding aspect of being a Vodafone Select dealer? We have not only grown with one of the biggest companies in the world, but we have evolved with them also. Each day we grow from strength to strength with Vodafone. A company with integrity and respect. A company which has responsibility to its community. That’s what we admire... its business and its heart. To be part of the world’s biggest Telco branded company – A.W.E.S.O.M.E!! Absolutely AWESOME! Nothing less! We can only go up from here! Vodafone was established more than 20 years ago in Australia. And while many years have passed, our mission remains the same: to deliver choice and value to Australians for mobile services. In 2009, Vodafone Australia merged with Hutchison 3G Australia, a joint venture between Vodafone Group Plc and Hutchison Whampoa, to form ‘Vodafone Hutchison Australia’. The company operates the Vodafone brand in Australia.